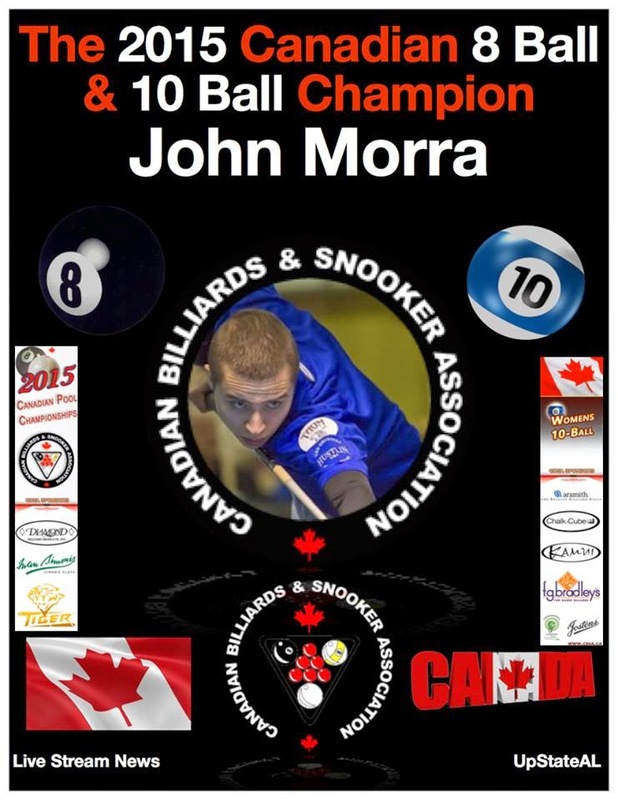 Thursday was the final day of the Canadian 10 Ball Championships. 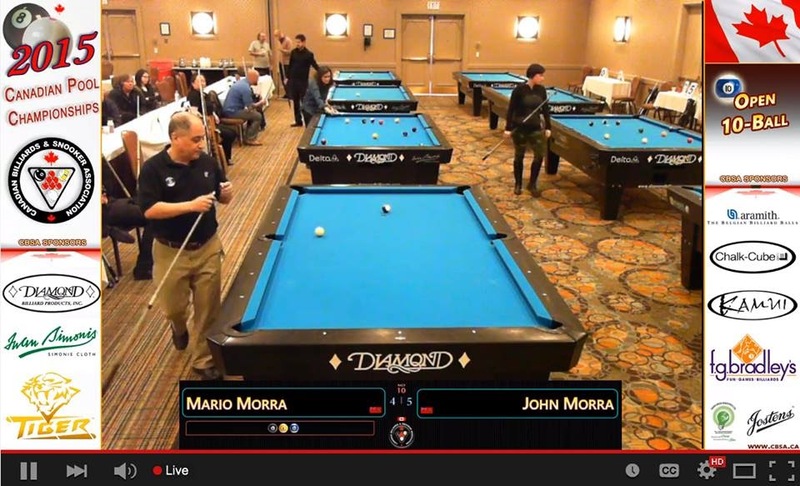 It kicked off with the highly anticipated Father/Son match up of John and Mario Morra. This was a thrilling match up as it is not to often you see such a pairing in the final four winners side of a National Championship. It was Mario who able to establish a lead first going up 8-5. However John was able to out duel his father the rest of the way to edge out a 10-9 victory. In the other final four winners side match Tom Theriault continued his solid play with a convincing 10-5 win against a very game Andy Aupin. Runner up in the 8 Ball Erik "Big Red" Hjorleifson was looking to make a charge on the losers side. Jesse Piercey would be Hjorleifson's first challenge of the day, and a challenge it was as this was a close match that ended 10-7 in Hjorleifson favour. He was also able to get by Andy Aupin 10-7 to set up a match with multiple Canadian Champion Jason Klatt. With some solid play Hjorleifson earned himself a 8-6 lead. Klatt then won the next 3 games to go to the hill first. At this point the match began to a feel a little bit like their last U.S Open encounter this past October. Hjorleifson had Klatt stuck 10-6 and Klatt came all the way back to win 11-10. However this time it was not to be as Hjorleifson got to the hill and then after some safety exchanges, was able to win the case game. Look out for Klatt the next few days as I don't see him being shut out of all 3 Canadian Championship finals. It was Tom Theriault and Erik Hjorleifson who played in the losers side final with Morra waiting in the hot-seat. Some good play by Theriault allowed him keep this match close until 6-6 when Hjorleifson took advantage of an error and never looked back wining 10-6. This set up a rematch of the 8 ball final between Morra and Hjorleifson. The final Day of the Women's division began with the hot-seat match between Naomi Williams and Brittany Bryant. A playful rivalry has developed over the years as these two have dominated the Canadian Championships. Thus making these match ups highly anticipated, and they usually live up to the billing. This match was no exception as it was close and ended 7-5 in favour of Naomi Williams. It was Joanne Ashton who came through the losers side to challenge Bryant. She did this with wins over Nathalie Chabot 7-4 and Maureen Seto 7-2. Ashton was looking to shake up the usual Bryant/Williams final but was unable to losing this match 7-1. 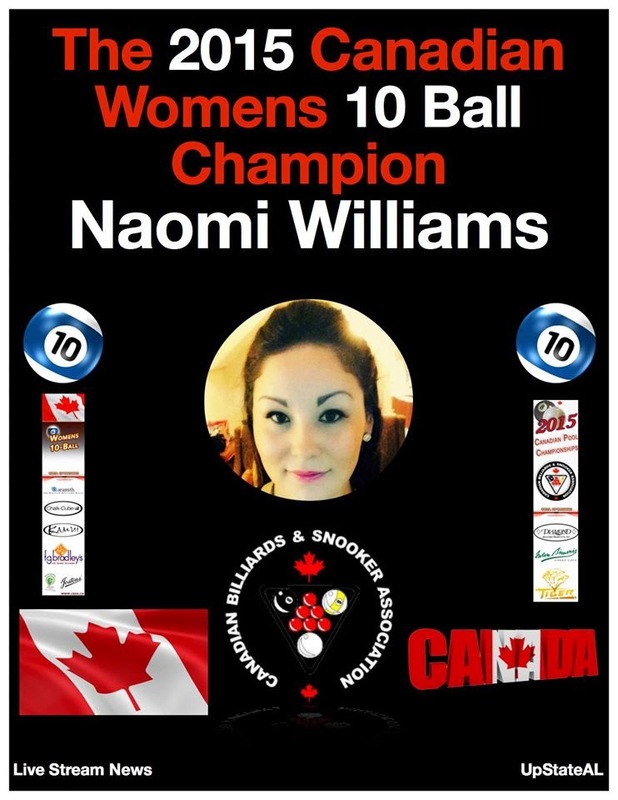 The final was another tight match with Williams just getting past Bryant 10-9 to win the Canadian Women's 10 Ball Championship.